Fully refurbished in July 2014, this one bedroom ground level apartment offers spacious accommodation for 2 people with the option of an extra double sofa bed if required. Presented to a high standard, it offers stunning, uninterrupted sea views through the valley. The apartment accepts a pet by arrangement and comes with free WiFi, linen and towels. Coastal View is located on Sealands Farm, it offers a peaceful retreat surrounded by farm animals and is within easy walking distance of the Wales Coastal Path and the private and secluded, Slade Bay. Oxwich Bay can be reached by car or foot and offers the recently opened fine dining Beach House restaurant or the Oxwich Bay Hotel which has a restaurant, bar and a very popular beer garden. The local shop is situated nearby which is open during the spring and summer months. Sliding doors lead into the modern open-plan lounge/diner/kitchen with 2 sofas, TV and DVD player, dining table and chairs and a fully fitted kitchen complete with washing machine and dishwasher. 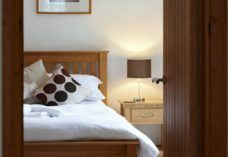 The bedroom consists of a king size bed, wardrobe and leads off to the fully tiled shower room. The property offers off road parking and ample space to walk around and exercise a dog! There is also outside table and chairs to relax in when the weather is fine. Owners always on site for any queries/assistance. A true home from home amazing accommodation. A view to bottle and take home with you. Lovely area to explore, rest, take photos and relax. We will highly recommend your cottage. Thank you for the treats. Lovely week’s holiday. Another great stay. A few rainy days but Rex simply assumed the indoor sheep watching position. Great walks and great beaches all from the front door. Scones on arrival was fab, just what was needed with a cup of tea after a long drive. Great accommodation. Fantastic weather. A real relaxing week’s holiday enjoying views from sofa when tired out after great walks. Lovely cake and milk in fridge on arrival, a real plus and a vase of roses to make it “home from home”. Many thanks. We have had a really lovely stay at this charming and homely cottage. A very stunning view set in such a peaceful surrounding This sort of cottage in such a beautiful place is a rare gem to find. Truly an amazing place to get away to. We will be back. Many thanks. We’ve had a lovely and very relaxed mini break here at Coastal View. The cottage is perfect for a little getaway and the location is great for exploring the beaches. We also loved the fact we were staying on a farm and got to see all the animals! Thanks for a lovely little getaway. This has been home from home, with great views, wonderful walks. Lola our boxer is going home exhausted. We will be back. We have had an amazing week and wonderful weather. Cottage was perfect with lovely views and lovely local walks. Many thanks. 3rd visit. Once again fabulous stay. Such a great place to chill & relax. So nice being able to walk everywhere from the door. My Jack Russel has loved the free entertainment provided by the cheeky lambs escaping the field. His collie cross has definitely come out. Have special requirements? Call Sara Jane Bennett on 01792 390247.